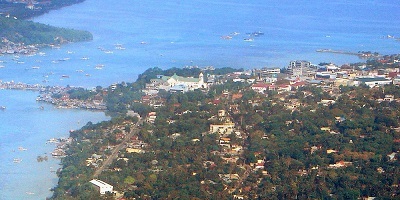 Tagbilaran City is the provincial capital of the province of Bohol: the hub of commerce and the lone city of the island. 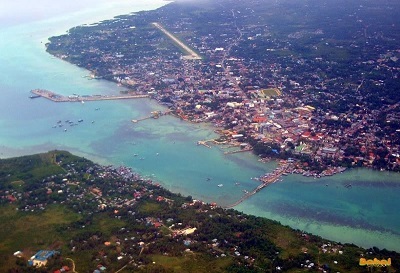 It is the principal gateway to the island province of Bohol and is known as the "City of Peace and Friendship". Tagbilaran is hailed as one of the eight “Philippine Dream Cities” by the Institute for Solidarity in Asia (ISA) along with the Island Garden City of Samal, San Fernando, La Union, Cebu City, Iloilo City, Marikina, Naga, Calbayog City and Surigao City. It is also considered as one of the Philippines’ twenty (20) “Most Competitive Cities” and “Pinoy Cities on the Rise” by the Asian Institute of Management Policy Center. Tagbilaran has a land area of 3,270 hectares including 13 kilometers of coastline and forms an elongated strip, with ridges and rolling hills. Two peaks rise on both ends, Elly Hill (100 meters) on the north and Banat-I Hill (145 meters) on the south. The name TAGBILARAN was derived from the word Tagubilaan, a contraction of two local dialect terms at that time; TAGU – meaning “to hide” and BILAAN – referring to a Muslim marauding tribe or Moros who were feared by the early settlers. In short, TAGBILARAN means “to hide from the Moros”. 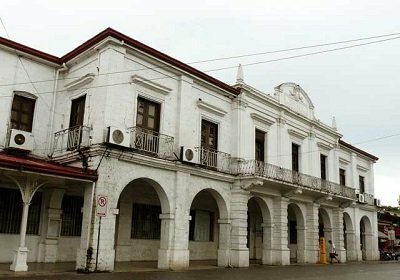 The history of Tagbilaran City dates back to the 15th century when it was known as the “Bool Kingdom”. By virtue of bones and other artifacts excavated by archeologists along the shorelines of lower-Mansasa, the early settlers were husky in build and generally tall and have established trade relations with China, Malaysia and Indonesia. Much later, in the 18th century, a more advanced and civilized community was established at Sitio Ubos, the lower coastal portion at the back of the present Cathedral compound. Trading, especially with Chinese merchants, was confined in this area which developed into a bigger settlement that spread outwards from the Cathedral compound. Most of the settler’s houses were made of bamboo, molave and nipa, except for the privileged few whose houses were made of limestone and bricks. The main tourist attractions of the city are the Kaingit Beach, Blood Compact Marker, Plaza Rizal, Provincial Capitol Building, Pres. Carlos P. Garcia Memorial Park, Ubujan Marker, Bohol Museum, Banat-I Hill, Elly Hill, Jaycee Promenade (commonly known as K of C Promenade), and the Mini Park. 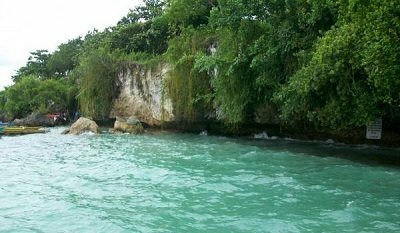 Along the coast of Tagbilaran is the Kaingit Beach, a favorite haunt of bathers during weekends with clear blue waters. The beach is situated in a cove located at the end of a side street from Graham Avenue, well protected even from stormy winds which make it ideal for kids. The area is being developed and maintained by the city government. Seafood, snacks and drinks are available for sale to bathers. 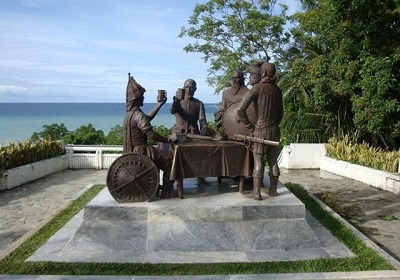 The Blood Compact Marker is located at Barangay Bool and identifies the spot where the blood compact between Datu Sikatuna, a native chieftain, and Don Miguel Lopez de Legazpi, a Spaniard representing the King of Spain, was held on March 16, 1565. This act is considered as the first “Treaty of Friendship” between the brown and white races. The Provincial Capitol building is of typical Spanish design with arcs and columns featuring the front façade. It is a huge stone building looking like a fortress of old. The seat of the provincial government of Bohol is housed under its roofs. It lies alongside a very busy thoroughfare with the Plaza Rizal just across the street. The Plaza Rizal is another attraction with wooden seats sporadically provided under trees where one can relax and commune with nature. Many pigeons inhabit the area which makes the place a favorite haunt for kids and adults alike. The pigeons are so used to the presence of humans that they just hop around when the kids run after them; sometimes flying off only to come back teasingly and land a few inches away. The Plaza was previously known as Plaza Principe and it is located between the Capitol Building and the St. Joseph’s Cathedral. Flags of All Nations are displayed in the Plaza and during the national day of a particular country, the corresponding flag is raised. Some of the flags were donated by the foreign countries themselves. 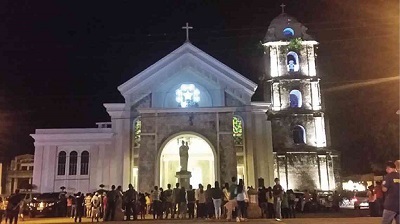 The picturesque Bohol Cathedral located along Carlos P. Garcia Avenue corner Torralba Street, just across the street from the Plaza, is another well-visited site. The cathedral is dedicated to St. Joseph, the patron of the City whose feast day falls on May 1. It is of Baroque architecture but remodeled after it was burnt down and now acquires a rather modern look. It is the seat of the Diocese of Bohol. In loving memory of the greatest Boholano who became the 4th President of the Republic of the Philippines, the Pres. Carlos P. Garcia Memorial Park was erected. 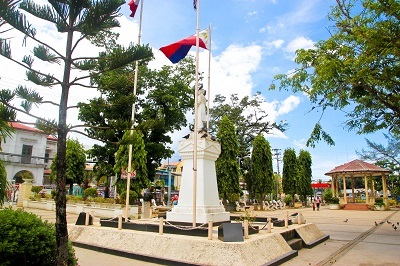 With an area of 11 hectares, the site is of rolling terrain and boast of a marble base monument and a life-size bronze statue of Garcia done by Bohol’s famous sculptor, National Artist Napoleon Abueva. Garcia was also the first President of the 1971 Constitutional Convention. Another marker erected in memory of a historic event in the district of Ubuja is the Ubujan Marker. 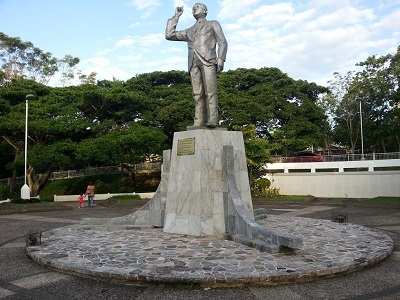 The site commemorates the battle fought by the brave guerilla Captain Francisco Salazar and his men against the superior forces of the Japanese on October 22, 1942. The event was a display of Boholano bravery of raw and naked courage against the well-equipped and well-trained Japanese soldiers. Capt. Salazar died in the field of battle bringing honor to his family and to the country for his bravery. 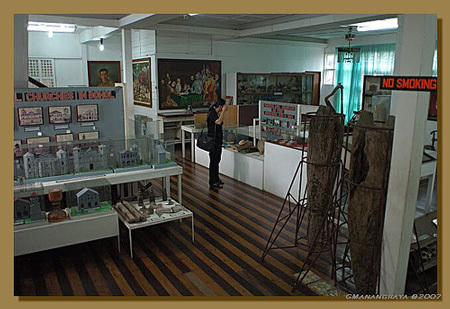 The Bohol Museum was once the home of former President Carlos P. Garcia and his family. On display in the museum are the family’s memorabilia, old relics, furniture and a collection of shells found on the shores of Bohol. It is a place where one will reminisce what Bohol was at that time and with the visit one will better appreciate how Bohol has evolved to what it is now. 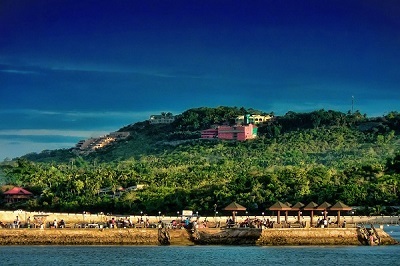 The peak heralding the border of Tagbilaran City to the south with an elevation of 145 meters is the Banat-I Hill. 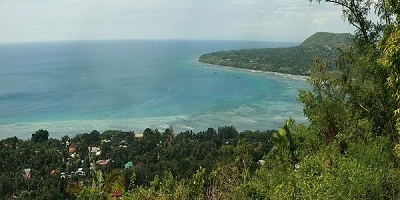 The hill commands a scenic view of the vast Mindanao Sea, of Negros and Siquijor provinces, and the Strait of Panglao Island. To the north of Tagbilaran City is Elly Hill with an elevation of 100 meters where one can enjoy the exquisite view of rich and verdant rolling hills and plains below it. 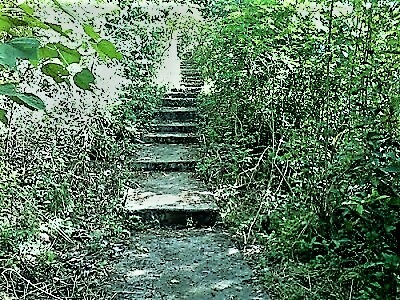 It is situated about 5 kilometers away from the city proper. The Jaycee Promenade juts out of the K of C reclamation area and is a joint project of the Bohol Jaycees and the city government. It is an ideal spot for an afternoon stroll and sunset viewing with Tagbilaran Bay and the island of Panglao in full view. Tagbilaran City lies 630 kilometers southeast of Manila and is located 72 kilometers south of Cebu City. It lies on the southwestern part of the province, bounded on the north by the town of Cortes, on the northeast by the town of Corella, on the east of Baclayon, and on the south and west by Maribojoc Bay and Tagbilaran Strait, respectively. Tagbilaran City has its own airport located about 5 minutes ride from the heart of the city. The Tagbilaran Airport is the main airport of the province and caters to three commercial aerial transportations such as Asian Spirit, Cebu Pacific, and Philippine Airlines. Regular flights from Manila, now almost daily, take about an hour and a half. 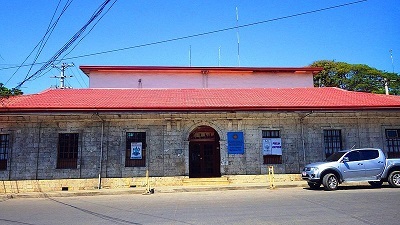 The Tagbilaran City Seaport is the main port of Bohol and accommodates large commercial passenger and cargo vessels from Luzon, Visayas, and Mindanao. The port attends to more or less 5,000 passengers daily. The Dao Integrated Terminal located in the Dao district services buses and vans plying routes to different parts of the province. Buses and vans wait here for riders at an interval of more or less 30 minutes in between from dawn until dusk. If riders are a-plenty and the vehicles are fully loaded, it will leave immediately. If not yet full but the designated time is up, the vehicle has to leave to give way to the vehicle next in the line. Tagbilaran City celebrates various festivals and feast days in each of its barangays from January to December. 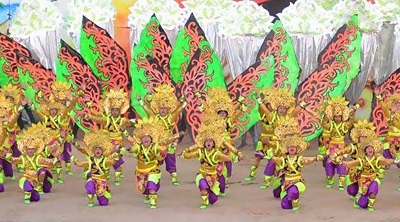 Most prominent of these festivals are listed in the Tagbilaran Festivals page. Established in 1742 as an independent town from Baclayon, it became a chartered city on July 1, 1966 by virtue of R.A. 4660, with a gross income reaching a 1.9 million peso mark thus classified as a 3rd class city. Now, the city has grown and with its present income may qualify for a 1st class category. The city is politically subdivided into 15 barangays or districts: Bool, Booy, Cabawan, Cogon, Dao, Dampas, Manga, Mansasa, San Isidro, Taloto, Tiptip, Ubujan, Poblacion 1st District, Poblacion 2nd District, and Poblacion 3rd District. For the year 2007, Tagbilaran has an estimated population of 94,137 (OCPDC estimate), with an annual growth rate of 3.2%. However, 41% of the entire population reside in the 4 urban barangays where trade and commerce are concentrated.